Currently, four communities in our state have launched a fully-certified Keep America Beautiful chapter (Mansfield, Natick, North Attleborough and Springfield). 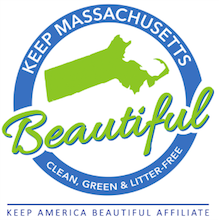 Several other Massachusetts communities or regions have launched or are in the process of launching a local Keep Massachusetts Beautiful chapter (Boylston, Cape Cod, Easton, Hopkinton, Hyde Park, Stoughton). Please visit these organizations’ respective websites to learn more or visit our Launch a Local Chapter page to learn how your community can benefit.